Saturn's icy rings shine in scattered sunlight in this view taken by the Cassini spacecraft wide-angle camera on July 4, 2008 at a distance of approximately 1.2 million kilometers (770,000 miles) from Saturn. 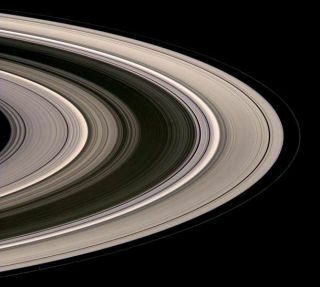 Saturn's rings may be much older and more massive than previouslythought, according to a new study. The study's computer simulation showed how theplanet's rings could date back billions of years ago to the early ages ofthe solar system, rather than only 100 million years ago (during Earth's Age ofDinosaurs), as previous observations suggested. The calculations are consistentwith recent observations of the rings by the Cassini?Huygens spacecraftcurrently studying Saturn and its moons. Larry Esposito and Joshua Elliott, both at theUniversity of Colorado, modeled how meteorites smash into the rings, shatteringthe ring particles and coating each one in a layer of ice and dust. Before,scientists had assumed that this shattering led to the eventual dissipationof the rings, but a new simulation, created by Glen Stewart and StuartRobbins of the University of Colorado, shows that after breaking up, theparticles could again clump together in a perpetual recycling process. Previously, researchers had thought the rings were relativelyyoung because they appeared bright and pristine, not covered with the detritusof billions of years of meteorites smashing into them. But the new calculationsshow that if the effect of this clumping and re-clumping is taken into account,the dust would also be recycled through the rings and wouldn't appear as darkas might be expected. Many scientists had assumed that we just happened to becatching Saturn at a relatively rare time when it had rings. Now it would seemSaturn, and maybe lots of other large planets in the universe also, could haverings for much of their lives. "Both Cassiniobservations and theoretical calculations can allow the rings of Saturn tobe billions of years old," said Esposito, principal investigator ofCassini's Ultraviolet Imaging Spectrograph (UVIS) instrument. "This meanswe humans are not just lucky to see rings around Saturn. This would lead us toexpect massive rings also to surround giant planets circling other stars." Our own Jupiter,Uranus and Neptune each have rings, and evenEarth might have had them once. Earlier estimates of Saturn?s rings' mass had come fromobservations of how much starlight is blocked by the rings. But the newcalculations indicate that these measurements underestimate the mass by about afactor of three, since they do not account for the clumping effect. If the rings are really more massive than thought, thatcould also help explain why the rings appear so bright and clean. The moreindividual pieces of mass in the rings, the more material there is to spreadthe pollution around, so the less noticeable it would be to outsideobservations. Esposito will present these findings at the EuropeanPlanetary Science Congress in Muenster, Germany, on Sept. 23. Cassini?Huygensis a joint project by NASA, the European Space Agency, and Italian SpaceAgency.